Merry Christmas to all, and hopefully, relief from floods and snow. Different problems here. Last year I produced a graphics gallery at Christmas, and I was hoping to have an update here. But there are some new things coming, so I'll do it when they are out. They are mostly to do with my new enthusiasm for large data sets selectively downloaded in response to user requests (via XMLHTTPRequest). I tried here combining the Google Maps survey of station with the machinery of the climate plotter. 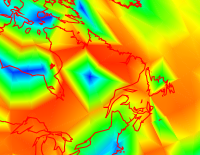 I'd like to do the same with the globe plots. I'll add globe plots of GHCN temperature for at least a century of year averages, and over decades, and combine that with the trend data to make a universal globe plot. 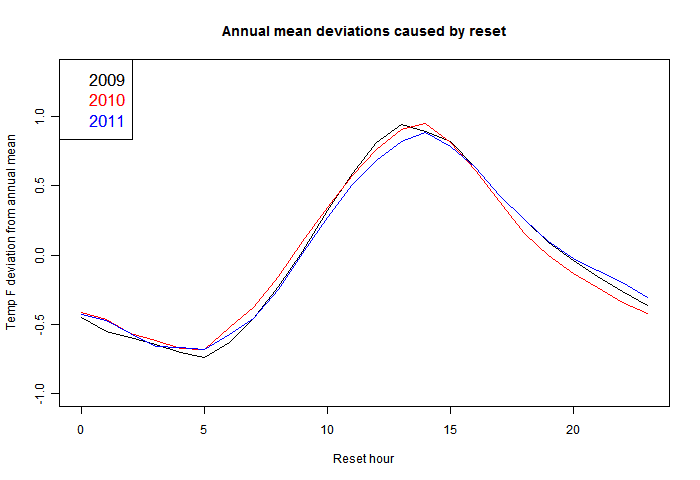 I'm also thinking about how to put monthly data in the climate plotter. There are issues about handling seasonality, and there are the mechanics of keeping it updated. But I think that can be mechanised. I'll also do some analysis of the ISTI data when it is out of beta. Wishing you all well for the New Year. This is next in the series of things that can be done with XMLHTTPRequest. It merges the capability of the Google Maps display of stations with the machinery of the climate plotter. But the key new thing is that the station location information can be backed up with a store of temperature histories, which can be plotted on demand. So what we have is a map which allows you to choose a category of stations to show with markers. The usual Google Maps interactivity works. You can choose from different data sets - currently there are GHCN, CRUTEM 4 and the new (and beta) ISTI. BEST will be there soon [Update - it's there now]. Mouse over the markers shows the name. But if you click, you not only get station information as before, but a plot of the annual temperatures in the record (for that data set). 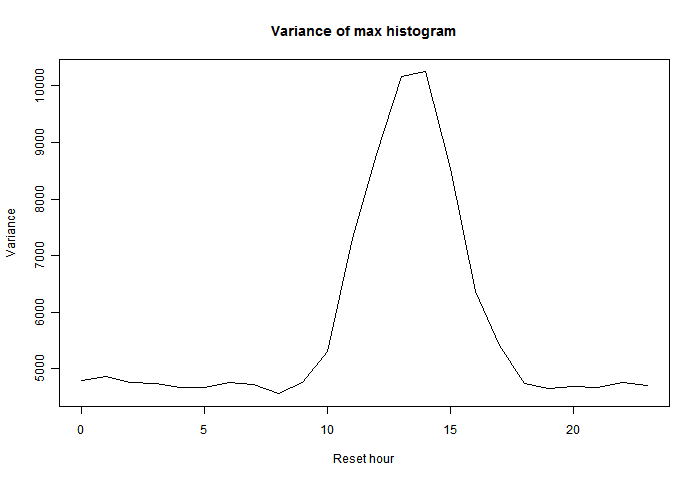 You can add to the plot, to, say, compare the records of different data sets. 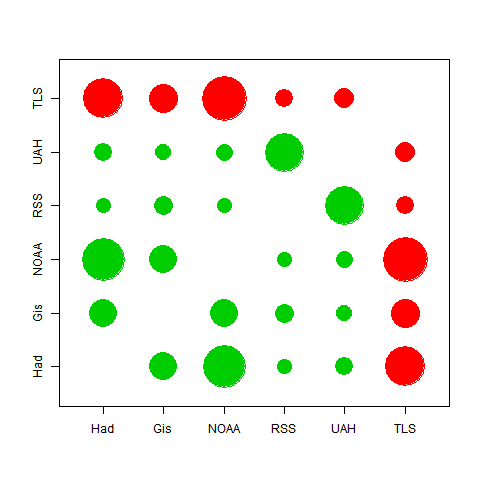 Or you can compare GHCN adjusted with unadjusted, or stations at different locations. And you can smooth and regress. There is an information window that shows the numbers. The map controls are in the table bottom right. Families of controls are indicated by background color. The marker buttons in the top row (None, yellow, pink) are the ones that create actions, in line with the current state of the other selection buttons. The world is divided into regions, because the larger sets (BEST and ISTI) will make everything about the map very slow if everything is shown. I'd suggest beginning by choosing a single region. 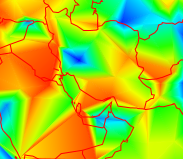 The region numbering is shown by a small map under the plot space. 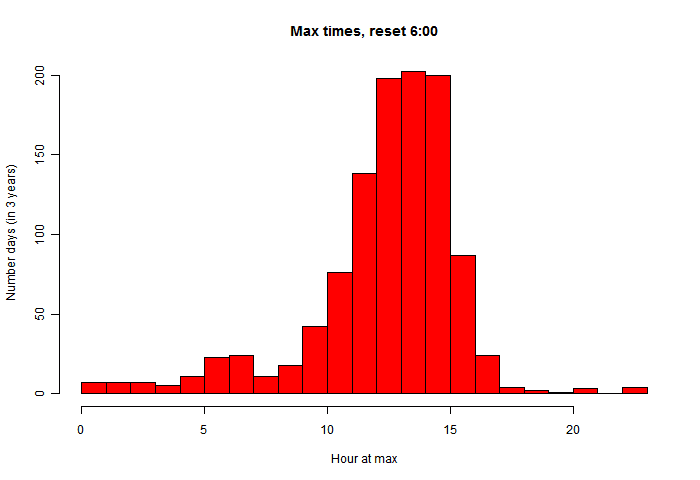 You should also choose one or more datasets - GHCN is shown by default, but can be unset. Gadj means GHCN adjusted. You'll probably only want one station for each color. BEST is coming, but not there yet. You can also choose a subset of those stations. You have to unset the All checkbox, and set the checkbox of the choices you want. The inequality buttons toggle. When you have chosen a color, marker representing your choices will appear. The choice "None" makes them disappear - often useful. Mouseover the markers to see the names, and when you click, detailed information will appear in the frame bottom left, and a curve will be plotted, or added to the plot. A handle for the curve will be added to the section headed. The x and y axes are active. You can click on the pink bars to translate. The step is equal to the distance from the green marker in the middle. The blue bars translate too, but with a fixed point, so the scale changes. On the y-axis, the top stays still, and the bottom point translates (and in between proportionately). For the x-axis, it's the right end that stays still. There is a column of controls headed Prop/value. To use these you set a value on the rightt, select handles of curves that you want to apply the change to on the left, and then click the prop button to make it happen. For regression you choose type and years (all is default). 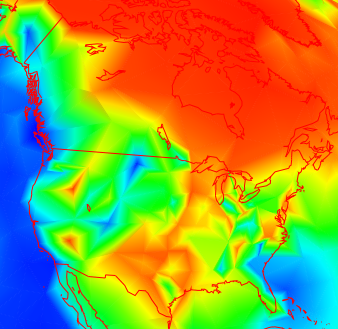 Colors you can choose from the vertical bar between plot and map. 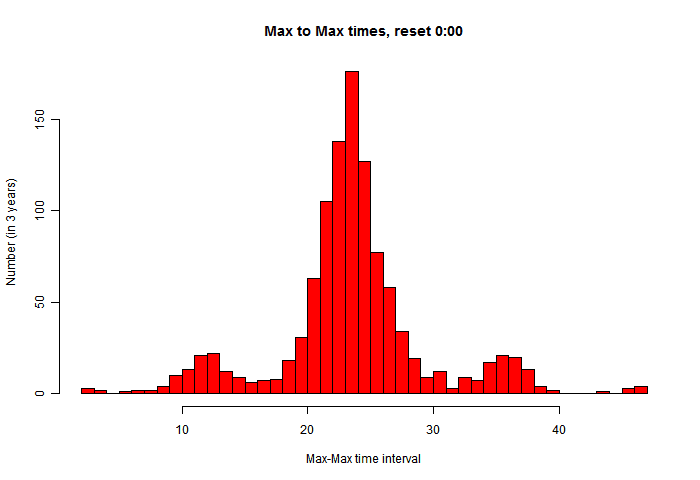 The offset is not incremental - it is what it shows. 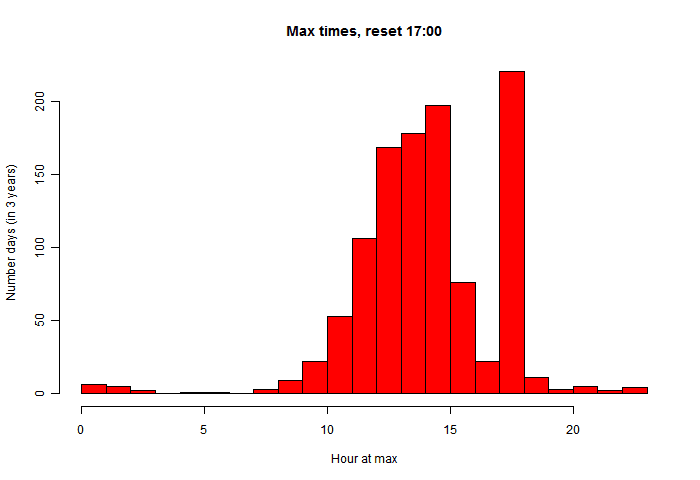 There are more usage details on the climate plotter page. 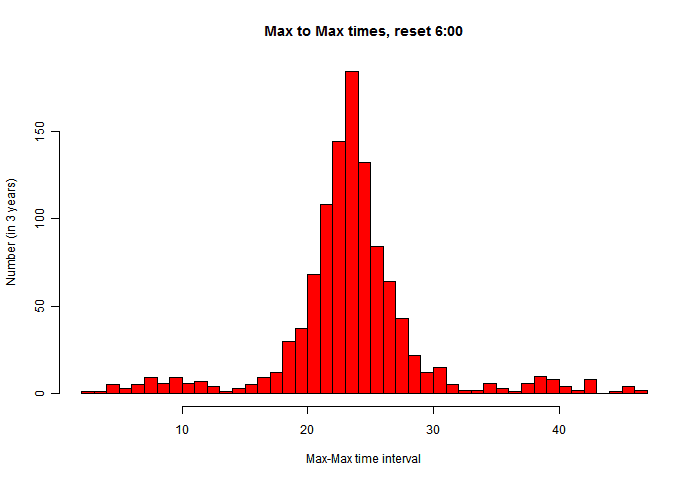 The plot shows annual values. These were taken from the monthly data by averaging (unweighted by days). Missing values were infilled by the monthly average for that station. If more than three months were missing, the year was omitted. I've also omitted sites with less than three eligible years. 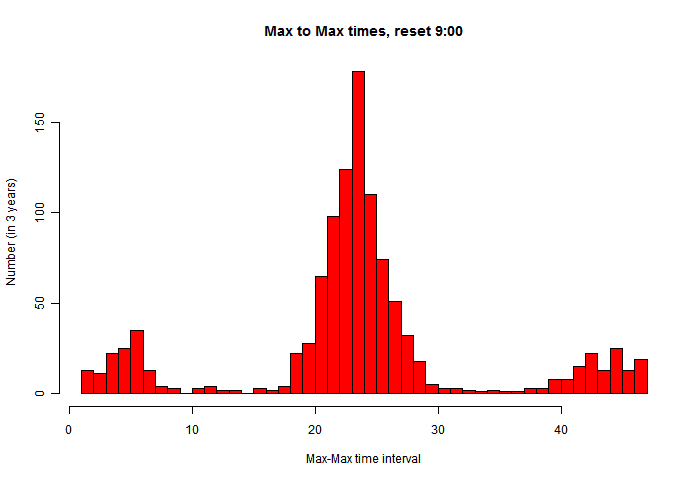 I see GISS has already posted (no change) - you have to be early to get ahead of them lately. But I'll produce the normal pair of posts with TempLS results and then comparison. The TempLS analysis, based on GHCNV3 land temperatures and the ERSST sea temps, showed a monthly average of 0.52°C for November, down from 0.54 °C in October. I had reported 0.52 °C for October, but late data raised it a bit. These are small changes. There are more details at the latest temperature data page. 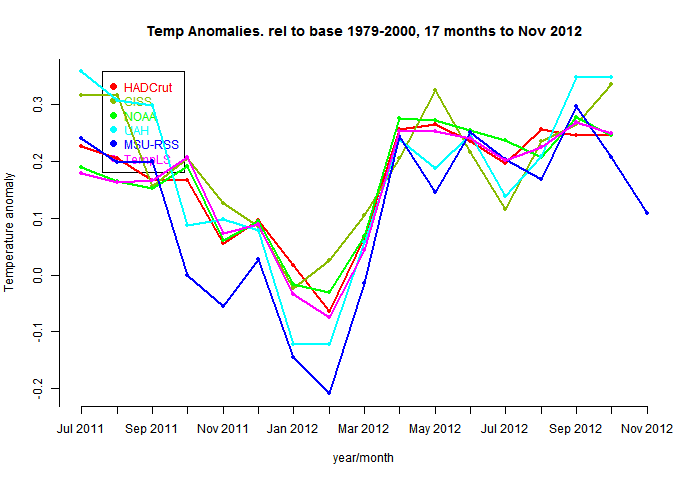 Below is the graph (lat/lon) of temperature distribution for November. I've also included a count and map of the stations that have reported to this date. 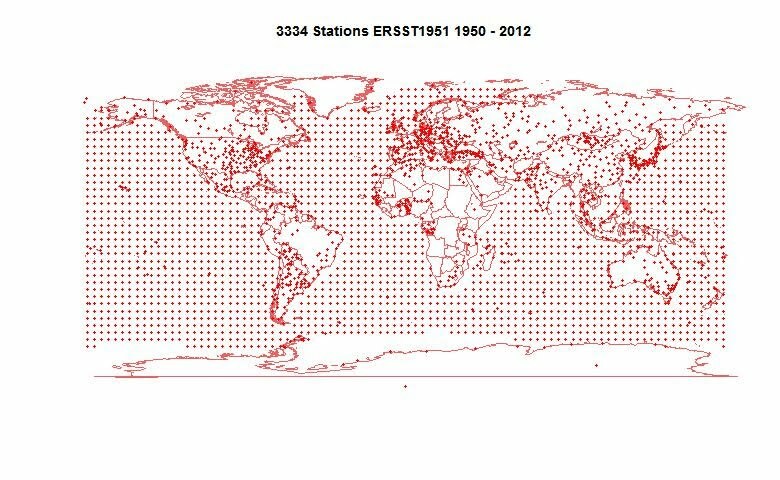 Here is the map of 3334 "stations" which contributed to this report. That's even lower than last month. So I probably couldn't have done this analysis any earlier. Since June 2011 I've been posting monthly TempLS global averages, before the other surface indices appear. The purpose of this haste is partly to see how well it performs in comparison, uninfluenced by "peeking". Here is a recent monthly comparison, with links to earlier months. I post the data here. So it's now time for a review on how well TempLS tracks. 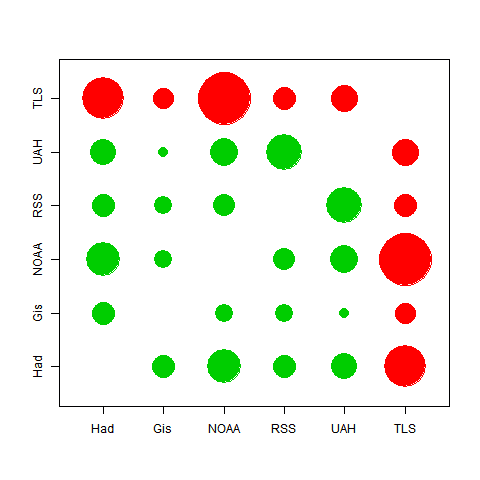 Along the way, I found some interesting results on how the main indices track each other. Now it becomes clearer. 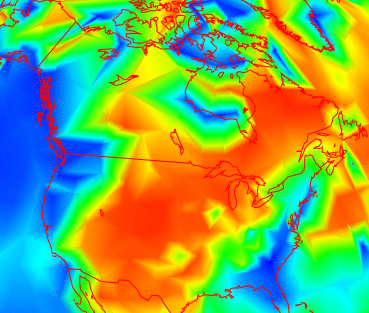 TempLS tracks NOAA very well, HADCrut 4 a little less, GISS less again, and the lower troposphere indices rather poorly. There is, of course, a good reason for this. 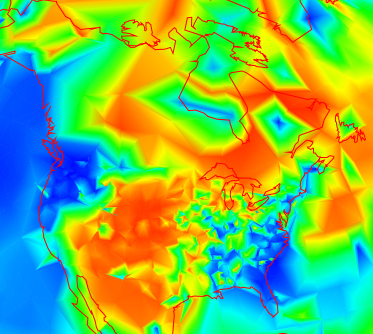 TempLS and NOAA use very similar datasets - GHCN land data, and ERSST. 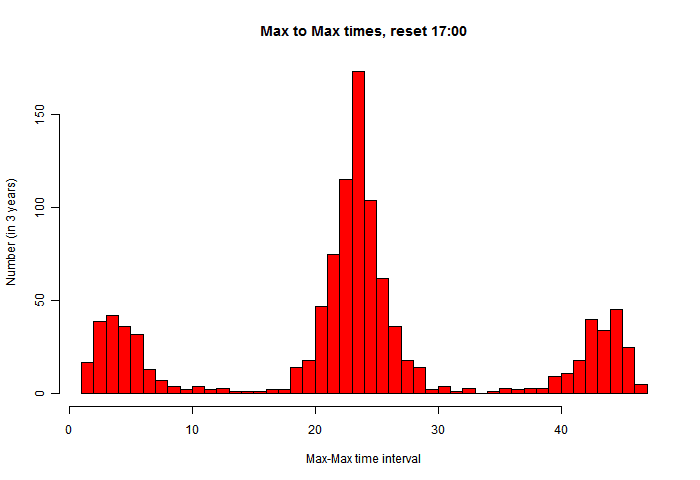 TempLS uses unadjusted GHCN, but there is very little adjustment in this time frame. 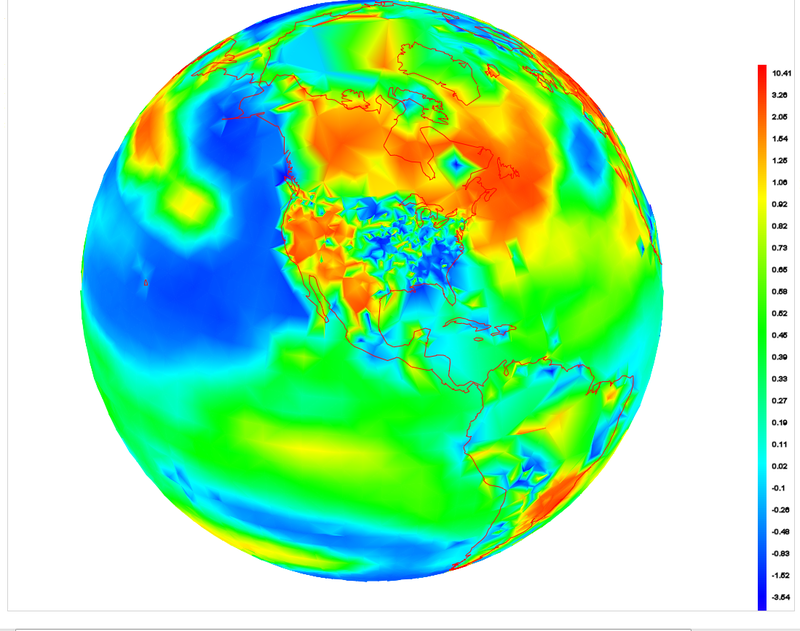 The differences are marked - 0.0183°C for NOAA vs 0.0653°C for GISS, relative to TempLS. where n is number of months. As usual, t is significantly above zero at 95% confidence if it exceeds 1.96. Actually, the significance is diminished by autocorrelation etc. Still, in cases of interest it clears that level by a wide margin. 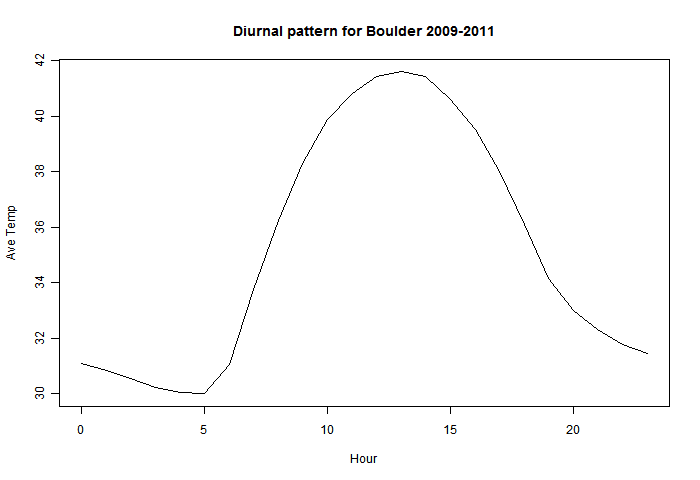 Here's a graphical representation of the correlation. The circle areas are proportional to the t-value of the pairing. Big means close tracking. In fact, the area is proportional to Ï*sqrt(1/(1-Ï*Ï)); there's no difference for one plot, but it means that when I compare to different periods, the circles do not inflate with the longer period. The best correlations are in fact between TempLS and HADCrut and NOAA, which likely indicates the commonality of their data sources. There is also quite good tracking between the satellite indices. It seems that the different methods used have less effect than the different data sets. I looked at the 17 months for which TempLS made predictions. But comparisons between other indices are valid beyond that period. As indeed are comparisons with TempLS, because in calculating the monthly values I actually didn't peek. 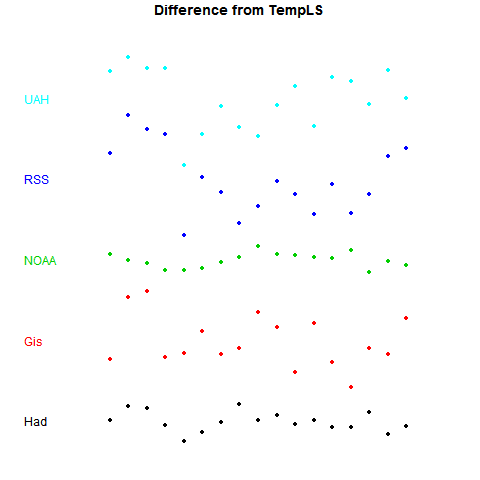 Correlation of TempLS and GISS seems better over the longer periods, and with NOAA not quite so good.. There are interesting patterns of correlation between the various temperature indices. Those using similar datasets correlate very well. GISS, which uses a more diverse set, behaves rather differently. TempLS fits very well into the NOAA/HADCrut grouping. 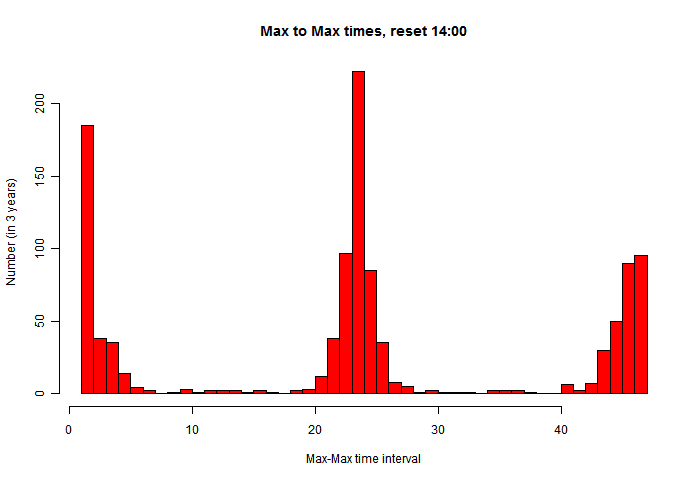 Using present expectation anomalies for station data. As I foreshadowed in a recent post, for plotting recent monthly data I wanted to shift from anomalies based on a past period (1961-1990) to one based on the present. For each station and each month, I would use the present value of a weighted linear regression as the expectation, and the anomaly would be the deviation from that. The reason was mainly that I suspected that irregular happenings in the history of the stations was distorting the anomaly base, and creating noise in the anomaly plot which isn't needed. 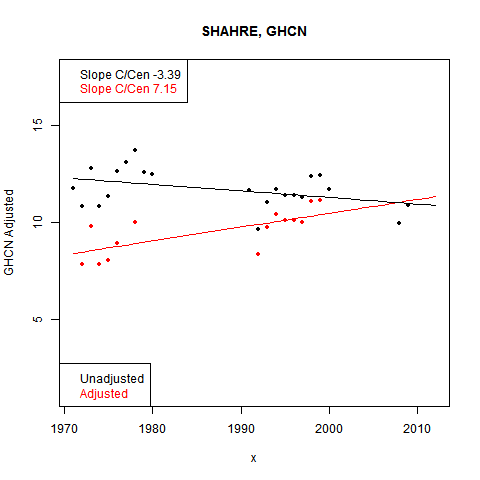 In my most recent post I traced the prominent deviations due to Nitchequon and Shahr-e-kord to gaps in the record and noted big (and probably correct) adjustments made by GHCN. I've done it, and the monthly maps now use this basis. I think it has been very successful in removing this source of error. 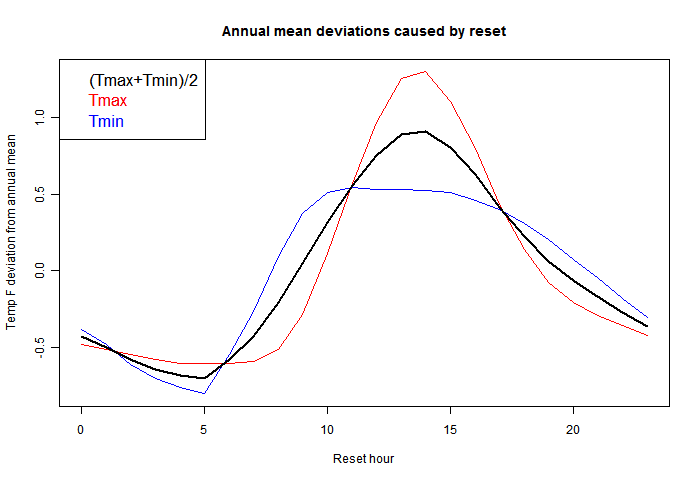 Of course, it also means that the anomalies do not give any measure of AGW. For that the right source is the trend map. Below the jump, I'll illustrate the improvement. Not only is the Nitchequon dip in Quebec gone, but the US is very much smoother. 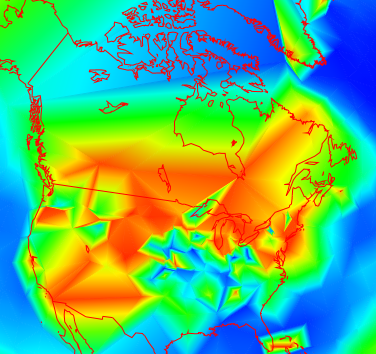 I have often commented previously how these plots seem less smooth in the US; that may well be due to a greater frequency of station changes. Anyway, it's much less true now. It also shows more emphatically how spatially correlated are the changes in individual station monthly averages. I've put up two recent posts which show temperature results for individual stations using a shaded mesh. One shows monthly anomalies relative to 1961-1990, or 1975, and the other shows trends. There's an interesting spatial consistency, with exceptions. The exceptions may be climate. But they may also be the effects of things happening to stations. This is what homogenization is designed to overcome, and I think there are some good illustrations here. I usually use GHCN unadjusted readings, mainly because people like to argue over adjustments, and I think for the headline effects they don't make much difference. But these spatial plots show that they can, and it's probably for the good. You can see the big blue dip in NW Quebec. That's caused by Nitchequon. The plots are of anomalies wrt 1961-1990. The same thing is seen in most recent months. It always seems unusually cold in Nitchequon. You can see a lot of missing years from 1984 to 2000 and even later. I've omitted years with less than 9 months of data, but that isn't the issue. Most of those years had none at all. And there's a lot of scope for something to have changed during the gap. Those past temperatures have been adjusted down. That would stop Nitchequon standing out as a place of ongoing (relative) cold. 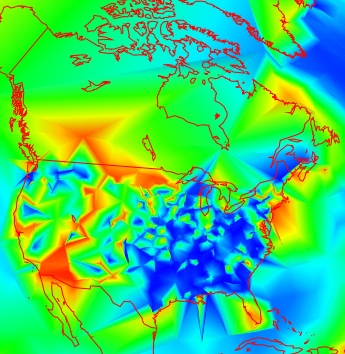 Ideally, I'd show you the plot with recalc anomaly base. But I haven't done that, because as foreshadowed, I'm moving away from using a past basis at all. Trends are more subject to measurement vagaries, especially long term trends. And this tends to show up as visible inhomogeneity. 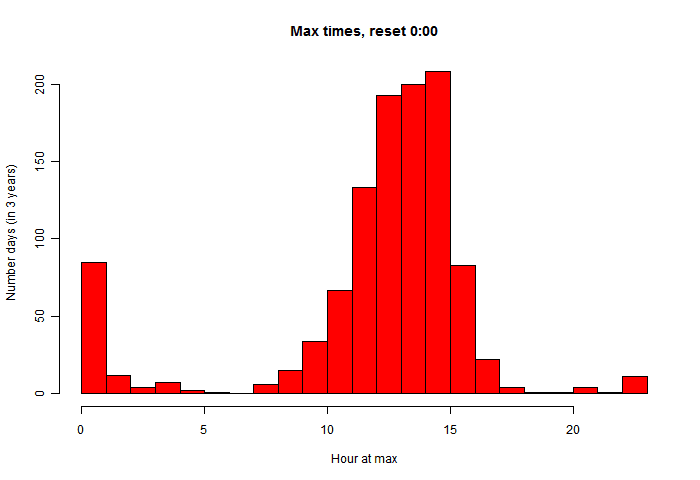 My trend plot now offers the option of using adjusted data. Data is rather sparse in Canada now, but the US shows a lot of variability. How much is due to measurement vagaries? You can see that the shorter term makes not much difference, but the longer term smoothes a lot. This is of course not surprising - it's what homogenization should do. I'm just noting that it does, and there did appear to be a problem. It wasn't bad before adjustment, and may be worse after. No real conclusions here, though I do notice a pattern suggesting that inhomogeneity is more of a problem in the US. But you can try your own cases. I went looking for more examples. Some really stand out. 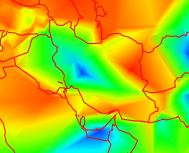 Here are the last three months of a place listed as SHAHRE... in W Iran (It is the city of Shahr-e-kord). Again, big gaps in the data, and the base period adjusted down in GHCN. I've recently posted a map (one of a series) of monthly temperature anomalies for individual stations. I've been thinking about what kind of anomaly is really appropriate here. 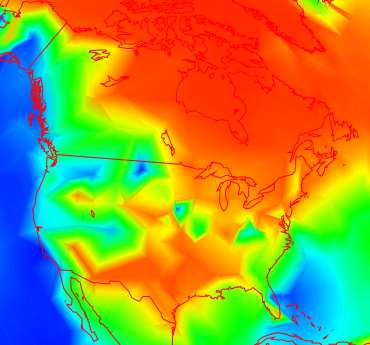 Some skeptics don't like anomalies, and say only real temperatures should be plotted. 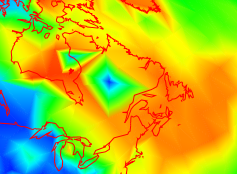 But then the plot is dominated by the variations in altitude and latitude. In January it's cold in Moscow and warm in Booligal. We knew that. If you hear that it was 15°C in Rome last month, you'll ask "but what is it normally?". You need the anomaly, because that's the real information in the month's readings. And a plot should show that. The anomaly is the difference between what is observed and what you expect. But what expectation? More below the jump. 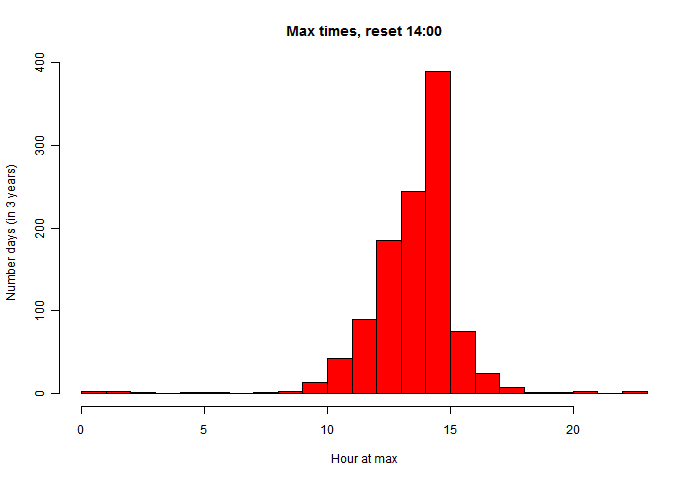 Indices like GISS and HADCrut use a thirty period to calculate averages on which to base anomalies. That's the expectation, so deviation from it includes global warming. That has to be related to a fixed period. I used that for the map anomalies. There is a practical difficulty that a station with October 2012 readings and a substantial history may not have enough information in, say, 1961-1990. This is the period that I used. So a reasonable thing to do is to use other information and get a regression estimate for 1975. That will avoid bias from a warming trend. The idea of that was that the anomaly will include global warming since 1975. And indeed, recent anomalies are mostly positive. 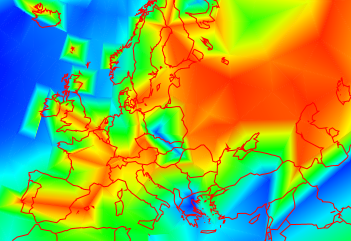 However, this isn't obvious, because by graphing scheme shifts the color map relative to the range. 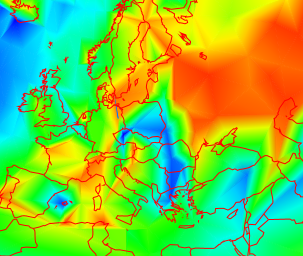 So because of warming, small positive anomalies are shown with bluish colors. That would be the same whatever base period was used. Looking at a monthly map, global warming isn't news. Even relative warming like that in the Arctic isn't new. Seeing a reddish Arctic month after month may not be what we need. Because it's all pushed into the upper color range, there isn't much new information. One thing that I think is important in these plots is that you get an idea of spatial consistency. Where it's hot, most stations nearby are hot. The colors are fairly smooth. This is only true if the anomaly base is also consistent. 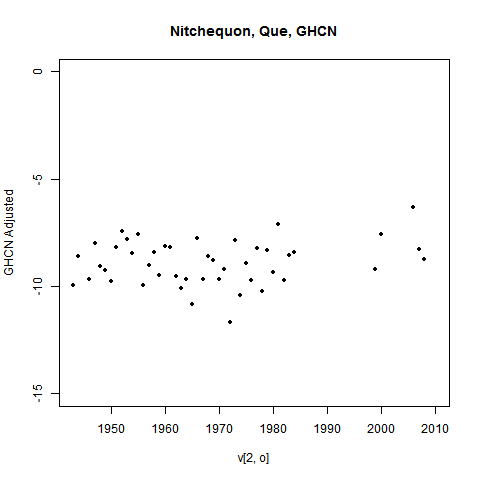 There is a station Nitchequon, in NW Quebec, which shows up with consistent low anomalies relative to neighbors. Otherwise Canada has mostly good consistency. I suspect the anomaly base is wrong. 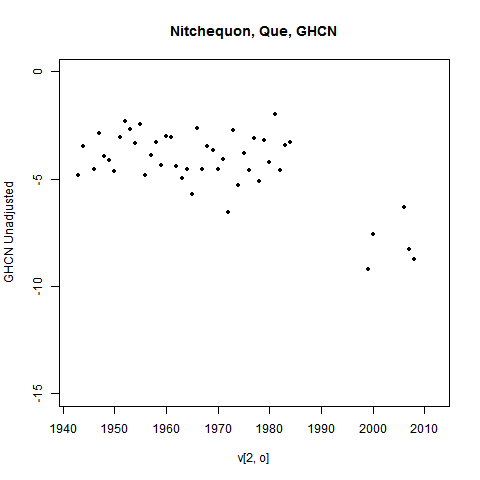 Nitchequon has a fairly long record, including quite a lot in 1961-90, but is missing many years from 1985 to 2005. Temperatures after the break are much lower than before. The adjusted version moves these later numbers way up. I'm using unadjusted GHCN. 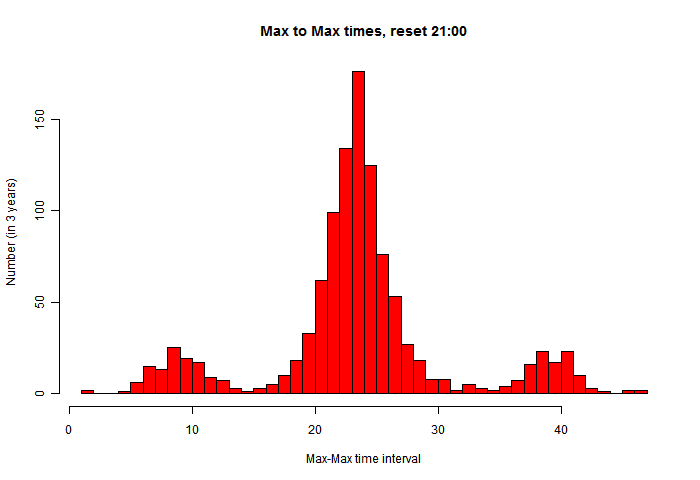 That's not so important in absolute terms, but, unadjusted, it does produce the marked dip in the plot. Incidentally, I think the Nitchequon story does show how inhomogeneities can really stand out to be identified. What does the expected value really mean? I could produce a value that allowed for ENSO, solar forcing etc. This might well be a lower variance estimate. But I think most users would expect to see those effects reflected in the anomalies, not removed from them. So there is a middle ground to be found. 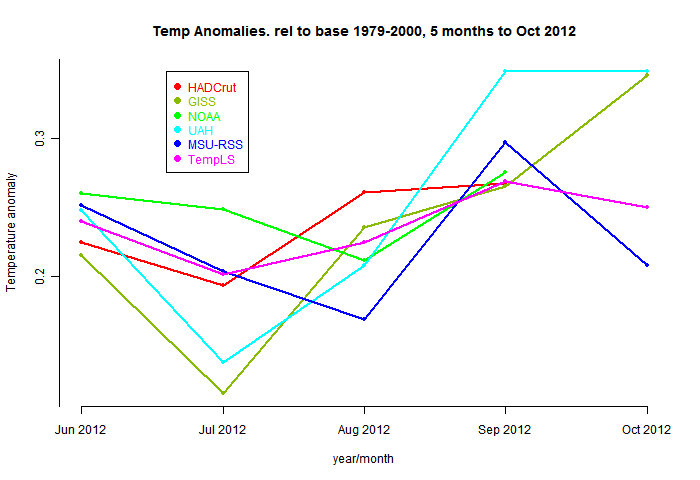 I think that I should plot anomalies relative to the current mean values (for month) with adjustment for trend. That would be the expected value. It has the advantage that it would avoid issues with past jumps, as at Nitchequon. And it does show the information that is new with each month. The L's are offsets constant for each month (m) ("monthly averages") and J is a linear progression over years (y). The weighting would be an exponential decay back in time, with a time constant of maybe thirty years. This would give higher weight to recent data. The anomaly would be the residual. I'll think about it a bit more, but I'll probably redo the data for the previous post. Update - it has now been done as described here. 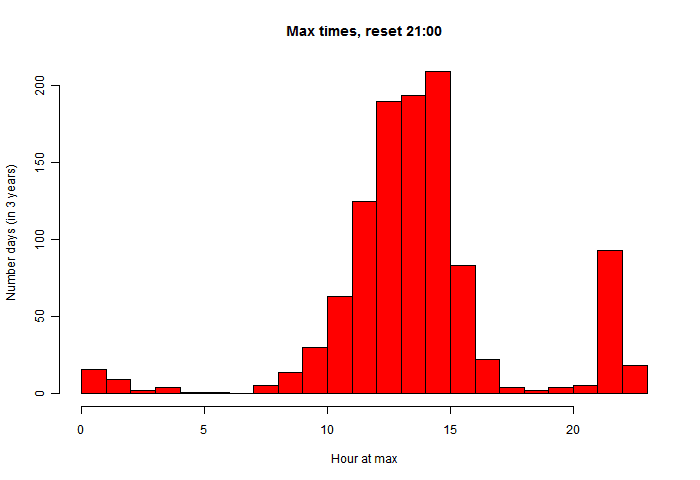 My initial exercise was the plot that I have sometimes shown for recent months (eg June). It's based solely on the data reported for that month (plus the anomaly base). But now you can select any month you like (currently only for this century). The data is downloaded when you ask, so there isn't a huge initial wait. 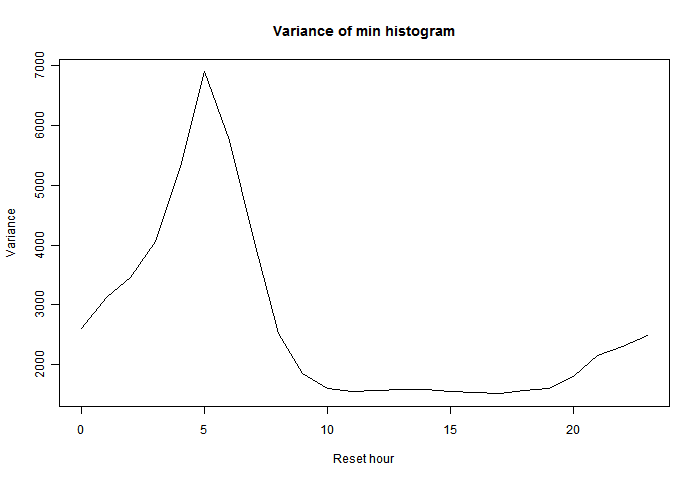 It's a plot based purely on the station data for GHCN V3 unadjusted and ERSST. For SST a "station" is a 4°x4° lat/lon cell. A triangle mesh is fitted and used for color shading between stations. As before, you can rotate the globe by selecting focus points on the top right map. You can magnify, display stations and mesh, and click to print numerical data (on the right). There are more details of that below. The plot is below. You can also click here to see it in a separate tab/window. More discussion and user guidance follows. When you select a month/year, you also have to refresh. Using the navigator automatically refreshes. Then you can click in the sphere. At the bottom on the right, the nearest station name and anomaly will appear. Lat/Lon and date are also shown. You may want to have stations displayed when you click. 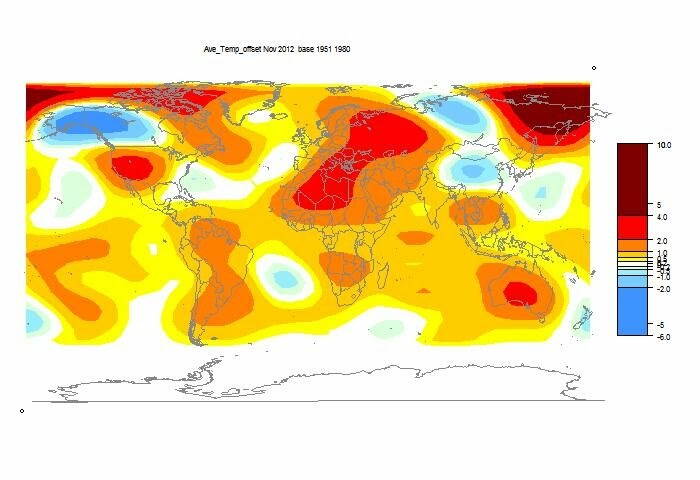 Anomalies are relative to the 1961-1990 period. 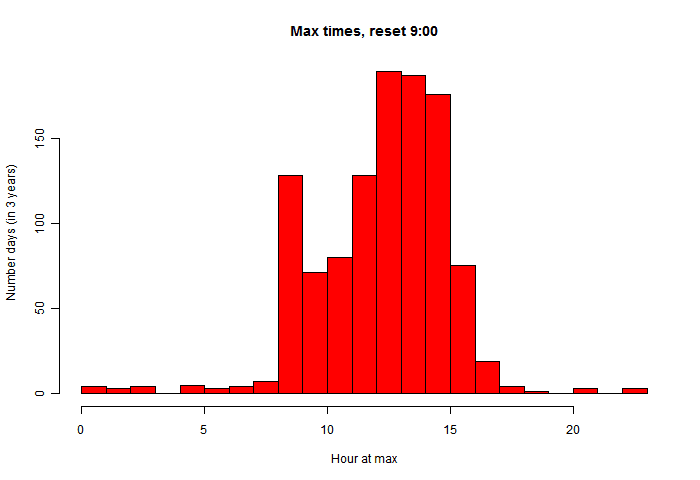 Where stations did not have enough data there, I took extra years and did a linear regression, and used the 1975 value. Update - as foreshadowed in later posts, I've now switched to a weighted linear regression estimate of present month value as the basis for the anomaly. The weight function is an exponential with a time constant of thirty years. The results are smoother. As mentioned, I'm using GHCN v3 for station data. I've downloaded late Nov 2012, and I probably won't update past months regularly, but I'll try to add future months as they appear. I'll update older data occasionally, since late stations will appear. I have taken a more conservative approach to GHCN - anything with a quality flag is not shown. That loses some good data, and I may review. ERSST shows frozen sea as -1.8°C, the temperature below the ice. I've eliminated these readings, as they don't reflect climate. The shading is not ideal, but is what HTML 5 provides. It gets two nodes in the triangle exactly right, and I've done the best I could with the third. Where there are big variations, you'll sometimes see nodes with adjacent shading which differs in some triangles. Usually the majority is correct. For a couple of years I've been running a daily script to track new monthly temperature indices and also sea ice data. The script posts them on the data page. 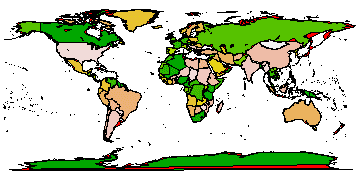 Indices are in black - spatial data (large) in brown. I can fairly easily add new sources to the list. I've chosen one representative file from each source, expecting that others of interest are likely to be posted at the same time. The list will be maintained on the data page. I also plan to post a history file (when there is some history). Some sources like GISS update their monthly postings frequently, so the date you see here may not be the first posting for the month. The TempLS analysis, based on GHCNV3 land temperatures and the ERSST sea temps, showed a monthly average of 0.52°C for October, down from 0.54 °C in September. There are more details at the latest temperature data page. Below is the graph (lat/lon) of temperature distribution for October. I've also included a count and map of the stations that have reported to this date. Here is the map of 3514 "stations" which contributed to this report. Reporting seems to be slow this month - there are about 500 less than usual for this time.